Sialic acids (Sias) are carbohydrates with immensely important roles in biological, pathological and immunological processes. This project aims to increase our fundamental understanding of the roles of bacterial Sias in host-pathogen interactions, and to characterize biosynthetic pathways and enzymes involved in sialic acid synthesis. From an applied perspective, such sugar-modifying enzymes can be utilized in many different areas of molecular biology and medicine, and a combination of chemical and enzymatic synthesis has the potential to produce new saccharides with useful properties. 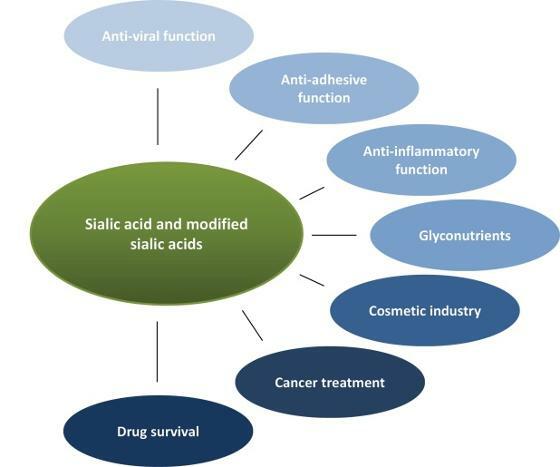 Today, the largest market for sialic acid is for use in the production of anti-viral drugs, but the largest future demand will most likely be as a nutritional additive, in particular to infant milk formulas, and for cosmeceutical and pharmaceutical applications. Genome sequences of several strains from our bacterial collection from the marine, arctic environment have revealed their ability to synthesize different Sias, and represent a novel source for the prospecting of new gene variants. Several enzymes involved in the metabolism of different sialic acids have been produced and functionally characterized by various biochemical and biophysical methods, and three dimentional structures are determined. The structural studies of sialic acid synthesizing enzymes will aid to reveal possible importance of sialic acids for bacterial survival in the host, and in turn enable the development of highly selective antibiotics. Sialic acid biosynthetic and modifying enzymes will be tested for their potential use in chemoenzymatic synthesis to create modified Sias with useful properties, for example antiviral compounds. Due to the psychrophilic nature of many of the bacterial strains they are likely to express cold active enzymes with high catalytic efficiency that additionally renders them as attractive targets for commercial exploitation.